Ingredients: C10-18 TRIGLYCERIDES, HYDROGENATED VEGETABLE OIL, HYDROGENATED COTTONSEED OIL, MICA, TALC, CAPRYLIC/CAPRIC TRIGLYCERIDE, TOCOPHEROL, ASCORBYL PALMITATE, CI 77491, CI 77492, CI 77499 (IRON OXIDES), CI 75470 (CARMINE), CI 77891 (TITANIUM DIOXIDE). 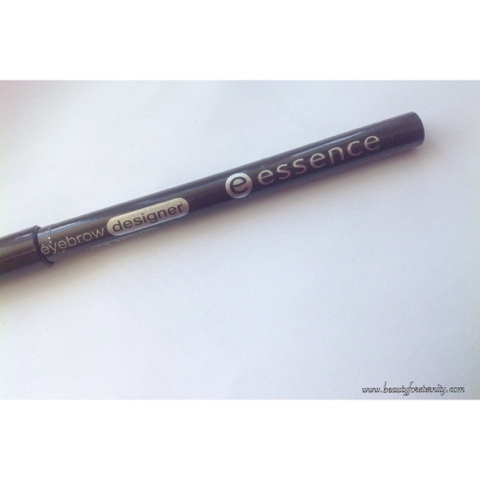 Packaging: Essence Eyebrow designer pencil comes with a tight cap which has got a very useful brush onto it. The brush is quite dense with nylon bristles and does a great job of combing the eyebrows and blending the product to create a natural finish. I wish it came with a sharpener also. Colour: I bought the colour 002 dark brown because I thought that the black looks over the top and unnatural. 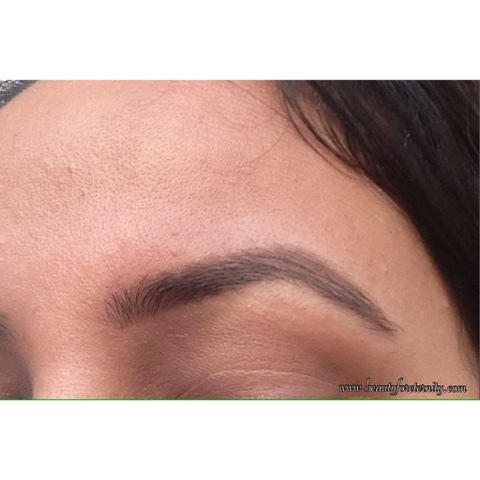 This dark brown colour suits me perfectly and gives a very subtle and defined look to my brows. It comes in a total of 4 shades so you can choose the one that suits you the most. Pigmentation: The pigmentation is lovely. It applies well even with a light hand and creates the illusion of hair where there are gaps in the eyebrows. 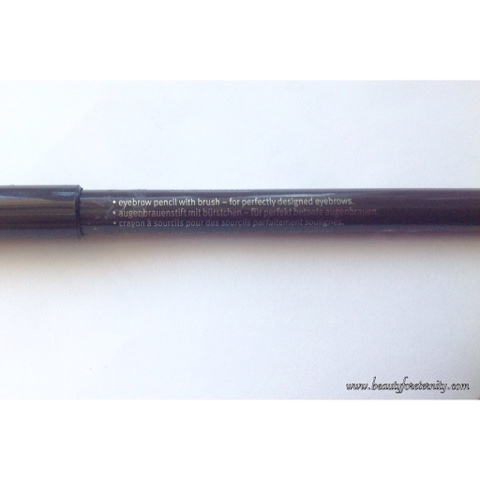 Texture: The texture of this eyebrow pencil is the best thing about this pencil. It's just perfect...neither too creamy nor too powdery. It gives a very natural finish and applies easily with a gentle hand. It sets to a matt finish and does not move or melt even in summer season. 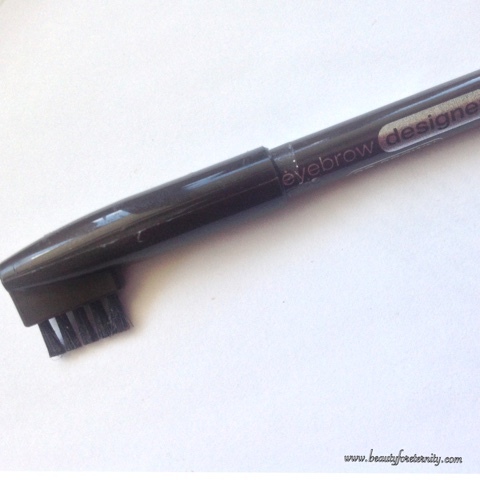 One has to use a wax or some brow gel to fix the eyebrow hair in place after using this eyebrow pencil because it's not creamy enough to hold the hair in place. I personally like this because not everybody needs to use a brow gel because they naturally have such eyebrow hair which stay in place. Finish: The finish is very natural. I apply it with a light hand and use small strokes to create the illusion of hair on the places where I don't have much in my eyebrows. It does not make my eyebrows look heavily done or OTT. Given below are the before and after pictures of my eyebrows. You can clearly see the difference in the way my brow looks in these. Lasting power: It lasts for good 7-8 hours on me. I have not tried to see it's longevity beyond that time limit because that's the longest time I wear my makeup on busiest of the days. However I do feel that this will last even longer than that. 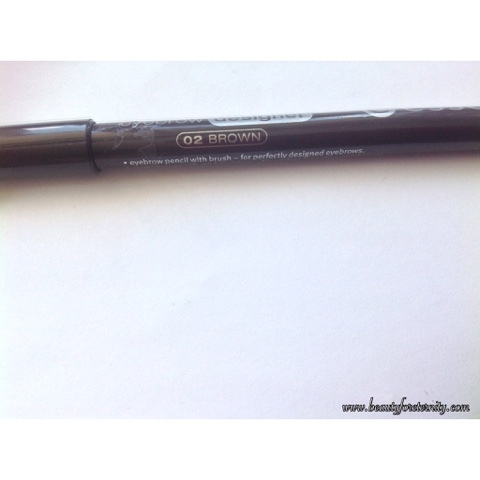 To summarise the whole review of Essence eyebrow designer pencil I would say that it is an affordable and easy to use tool that helps to achieve those fuller eyebrows in no time. 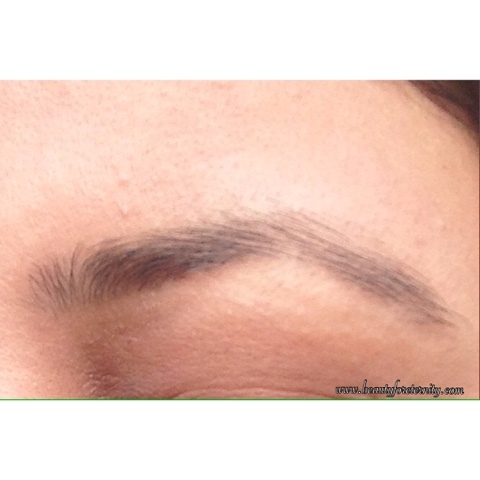 It's much easier to use than brow powders and other eyebrow products. Even people who are beginners in makeup an safely give it a go and achieve better looking eyebrows with ease.For the price it's offered at, it's definitely a steal. Definitely go for it because you will love it and repurchase it. I seriously recommend this to everyone.